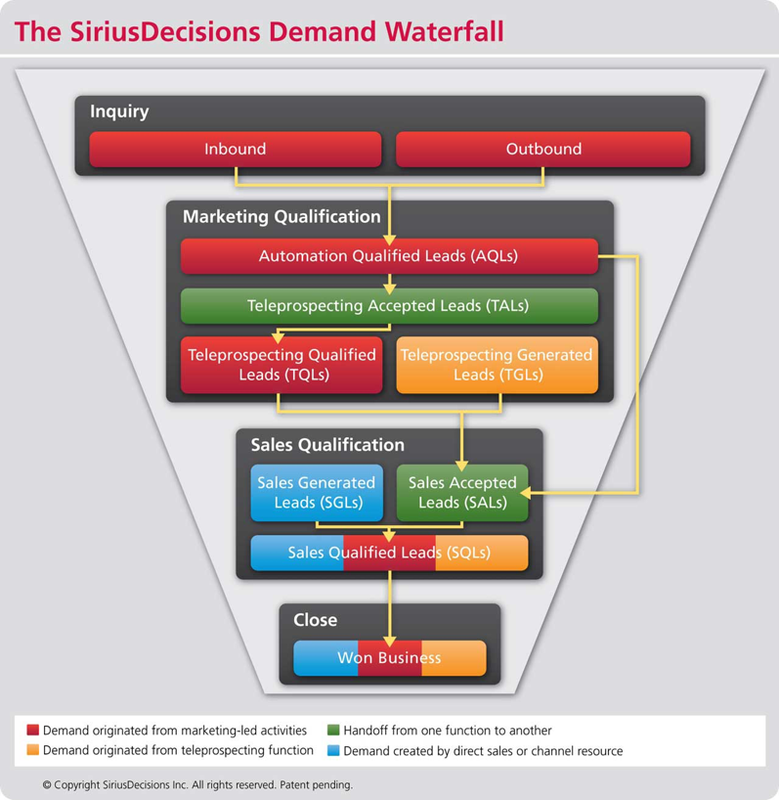 In the past decade, marketers have made fantastic progress in their ability to measure and optimize the demand waterfall.Sirius Decisions, a leading marketing advisory firm, has been a key thought leader in this area. They have developed a far more refined view of the demand waterfall, incorporating the concepts of tele-prospecting and inbound into their model. What most people have missed is the fact that the demand waterfall is a tiny piece of a much bigger system that needs to be measured and optimized. The broader system is something that I called the “end-to-end sales and marketing machine” – a reference to the point that demand is created and optimized via a collaboration between sales, marketing, and the channel. The chart below shows how I look at the demand waterfall (the little green part, rotated 90°) as part of this broader system. Demand sources. There are multiple sources of leads and opportunities that contribute to the overall demand for your products and services. In more mature B2B businesses, sales and indirect channels often contribute more demand than the independent efforts of marketing campaigns from a demand generation group. It’s critical to understand the relative contribution from these sources so you can optimize your spend, set expectations, and consider the interaction between the different demand sources. In many cases, your prospects may interact with multiple demand sources over a long period of time – ultimately resulting in a qualified opportunity. Qualification process. In my experience, marketing teams spend a lot of time refining the qualification process for the marketing campaign funnel. In some cases, not enough attention is spent on the qualification process for leads and opportunities that come from other sources. You may find that the qualification criteria are different based on the original lead source – depending on which ponds are being fished. Sales stage conversion. Understanding the conversion rates for opportunities as they progress through the sales funnel is a critical part of your optimization process. Many demand generation managers focus on lead qualification metrics, but they don’t realize that certain leads never make it past the early stages of the sales opportunity cycle. Measuring conversion across the entire system often illuminates key areas that can be improved to drive better throughput. Pipeline conversion programs. Many marketers put very little thought into the development of pipeline conversion programs. If you study the sales stage conversion metrics, you might find that there are areas that are ripe for optimization via the application of some pipeline conditioning programs. For example, providing return on investment examples in the proposal stage may increase the likelihood of making it to the next step. In providing thought leadership well into the opportunity stage may deliver the message that you are not going to abandon your customer once they have signed the contract. Nurturing programs for opportunities that fall out of the pipeline. What about those opportunities that don’t make it to the next stage? They may be great sources of future opportunities if you condition them appropriately. If you study when things drop out of the cycle and understand why they drop out of the cycle, it may help you identify that there are certain segments of opportunities that just aren’t ready yet – and putting them into a cycle to keep them warm and reengage at the right time could bear significant fruit. Customer base programs. Now that you have closed the deal, what are you going to do next? Your existing customers are often the best source for future opportunities. they have already invested in your company, so what are you doing to expand the opportunity? Awareness and reputation. Demand generation professionals often overlook the impact of awareness and reputation in their program mix. If these broader programs are missing from your overall marketing mix, you may find that your demand generation is less effective – in your sales cycle is longer because you need to educate your customer on the value of your company. If you zoom out from your focus on the demand generation waterfall and look at this broader system, you will start to see patterns emerge. This lens will help you determine your overall focus and marketing spend – driving a more integrated approach to the market. This graphic also tends to be a very effective diagnostic. You can use this to have the discussion with your sales and channel teams to get alignment on the sources for demand. You can even start by color coding each segment red, yellow, or green based on how you think you are performing in each of those areas. As you develop more sophisticated targets, you’ll be able to turn this into a dashboard over time. You will also find that even this view may not be broad enough to capture the total opportunity. There may be a similar model for each new vertical, geography, or other market segment.